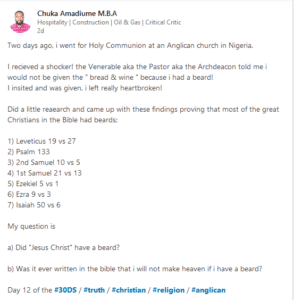 A Nigerian man has taken to social media to reveal his displeasure after being denied the Holy Communion because of his beard. 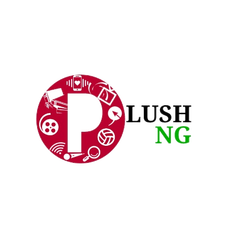 According to the heartbroken man identified as Chuka Amadiume, this happened recently at an Anglican church despite his insistence. Two days ago, i went for Holy Communion at an Anglican church in Nigeria.I received a shocker! The Venerable aka the Pastor aka the Archdeacon told me i would not be given the ” bread & wine ” because i had a beard!I insisted and was given, i left really heartbroken! a) Did “Jesus Christ” have a beard? b) Was it ever written in the bible that i will not make heaven if i have a beard?